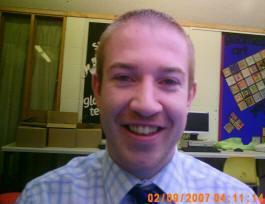 Mr. Wallace has worked at Katherine Semar Junior School since 2007. He is currently working in Year 4. We sent some Year 6 students to interview him. Q. What is your favourite sport and why? A. I like Rugby because it uses lots of physical contact. I think it's a proper sport. I've played since I was 6. Q. Do you play for any teams? If so, what teams do you play for? A. Yes, I play for Shelford Rugby club. Q. Which football team do you support? Q. What was your job before you came to Katherine Semar? A. I was working in Cancer Research, sending packages off. Q. Do you like your job at Katherine Semar? A. Yeah I do like it. It's a variety of things to do. A. When I was in 6th form, on my first day of college, I went to the library and took out a book, not realising when I walked out all the alarms went off and I went bright red. Q. What are you most scared of and why? A. I'm scared of aeroplanes it's just the lack of control. It's just amazing. Q. Who is in your family? aunts, no 2 aunts yeah 2 aunts, 2 uncles and 6 cousins. A. I think I was very lucky; I was always doing lots of sport and didn’t get into trouble. Yeah, I think I had a nice childhood. Q. Who is your favourite teacher and why? A. Mr. Hull because basically he is a chilled out entertainer, um, Mr. Lloyd is the cleverest teacher. His nickname is ‘Mr. Google’, he is a close second. Mr. Wallace was interviewed by Laura and Nicole.